I decided to do an overnight trail in Kosciuszko National Park. Its been a while between hikes involving a full pack so this one was at a gentle pace. 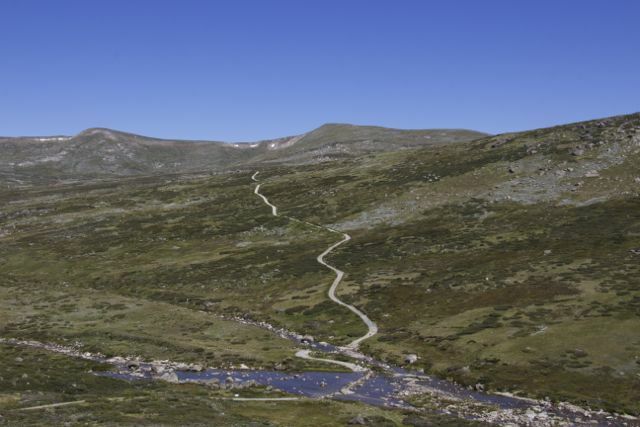 Mt Kosciuszko, whilst the highest point in Australia, the track there is not the most demanding. It is however beautiful this time of year. This area is more familiar to me in winter when I have visited to ski a few times. Although I use the term ski loosely – it’s not my greatest talent. Either was I was back and the snow was all but gone so there was nothing impeding me getting up or down the mountain. Except maybe the flies. If anybody is planning a trip bring the bug spray. I started The Main Range Track at Charlotte’s Pass to make it a 2 day loop of about 30km. Almost immediately the track descends to cross the Snowy River, which it actually the lowest point of the track. So that means only one thing – up! It’s a very well marked and well maintained track and the only thing slowing me down was stopping to have a chat with others. One of those days when you just keep meeting friendly people. Also bumped into the ranger along the way also who advised me that my choice of colours appeals to the flies – back to the khaki next time, those flies are pests. As to the colors attracting the flies – I love bright yellow blouses, but always decide against buying them at the very last minute when I think of all the bees, flies and beetles whose attention that lovely color would immediately grab. It’s a tough life :D.
It looks like it’s an absolutely lovely trail! Thank you! It’s nice be back doing some blogging.